In the "Old days" you had few options to learn martial arts. The second option was to travel. For this you had to be rather committed to your training. You would have to leave family and friends, put your career on hold, spend a lot of money and travel to some far off place for an extended period of time, perhaps even years. Few were able to do this. When you came home you had to rely upon your memory and perhaps some notes and rough sketches. Thus US Marines and soldiers in the Far East brought home diluted version of Asian martial arts and began to teach. If they were confused about something there was no one to ask. One friend of mine waited ten years before being able to ask his instructor a question. Today we have the internet, DVDs etc. You have a choice of an endless number of styles to choose from and within each style an endless number of instructors. Of course too many choices is also a challenge. Moshe Katz at Karate College, traveling a long distance seeking martial arts knowledge. There are many advantages to on line style training, as well as few shortcomings. With IKI Krav Maga we try to address these issues and give you the best of both worlds, on line and in person. When I was training with my teachers, both in Israel and abroad, I was known as the guy who took the notes. I have endless notebooks filled with notes. But it was not enough. I would watch my teacher teach a technique and then, to the annoyance of my training partner, I excused myself to write down some notes and perhaps draw a picture of the technique. Half the time when I came home...it made no sense at all. I would turn the drawing this way and that but still...could not figure out what was going on. I lost on three counts; my training partner was upset with the constant delays caused by my note taking, I had less time to train at the gym/dojo when the information was most fresh, and my notes were never as clear as I am hoped. I found myself at home hopelessly trying to recreate the technique. Today we have videos. When the On Line video training and DVDs we can go home and view our teacher doing the technique again and again. And no one gets annoyed. But still there are questions. What if this or that happened? What about from another angle? With our on line program you can send in your questions, you can request any technique you like, you can ask for a video clarification of the technique you did not understand. You can even film yourself doing a technique and ask what you are doing wrong. But still...there is something about training with your instructor in person, face to face. No doubt about that. There is a great deal that happens "in between the lines". There is a great deal that you can only learn in person. Training in Durban, South Africa, Next Durban seminar will be August 1 -3, 2014. Contact me for details. Training in person is not always easy to arrange but it is possible. With regular training sessions scheduled here in Israel and IKI seminars around the world most students have an opportunity to train with the head instructor in person and clarify any doubts about techniques. I am privileged to see some of my students several times per year. Each time they have questions and I am happy to come up with solutions. Even when going over old techniques we find little areas that need to be improved or corrected. There is a constant need for revisiting the techniques and making sure that everything is on tract. Mistakes take place and bad habits sink in, the in-person training corrects all those issues and makes sure we are all on the same page. There are huge advantages to on-line training and DVDs but nothing can replace in-person training. The optimal solution is a combination of the two. It is fun to attend a seminar, pick up a technique or two, think that you "got it", get a photo op with someone famous and go home. But when you go home and try to teach those techniques they do not always work so well and you come across poorly to your own students. A seminar should be more than a weekend of fun, it should be part of an over-all learning strategy. The on-line program combined with in person training whenever possible offers the best possible solution, short of living near your instructor on a regular basis. If you are committed to being the best at what you do you will find a way. 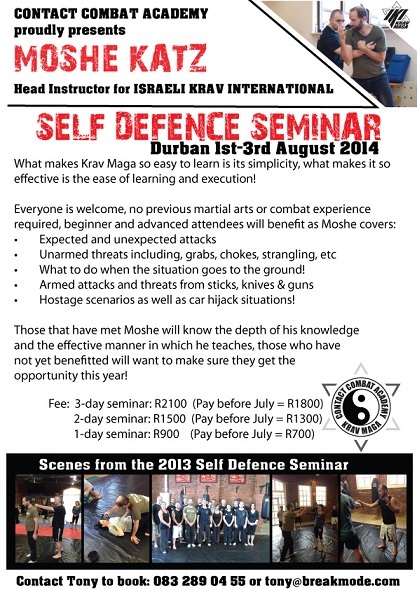 Fourth Annual IKI Krav Maga seminar in Durban, South Africa. Sign up now and save. Contact me for information about seminars in Johannesburg, South Africa, in late July. Commit to being the best!